Create step-by-step inst­ruc­tions and visua­lize product compon­ents as well as diagnostic data – without coding skills. By re-using 2D and 3D content, rich media and video, you can turn paper-based manuals into inter­ac­tive guides – for Android, iOS, Windows and Micro­soft Holo­lens..
You would like to introduce an AR content creation platform into your corporate infrastructure and are already using Siemens Teamcenter? With REFLEKT ONE you can easily access data in Siemens Teamcenter and feed existing information around structure, design and visualization directly into your content creation process on the REFLEKT ONE platform. In our recent blog post “How to create AR solutions from your existing Teamcenter data” we talk you through just how easy it is to combine the two in a simple three-step process. 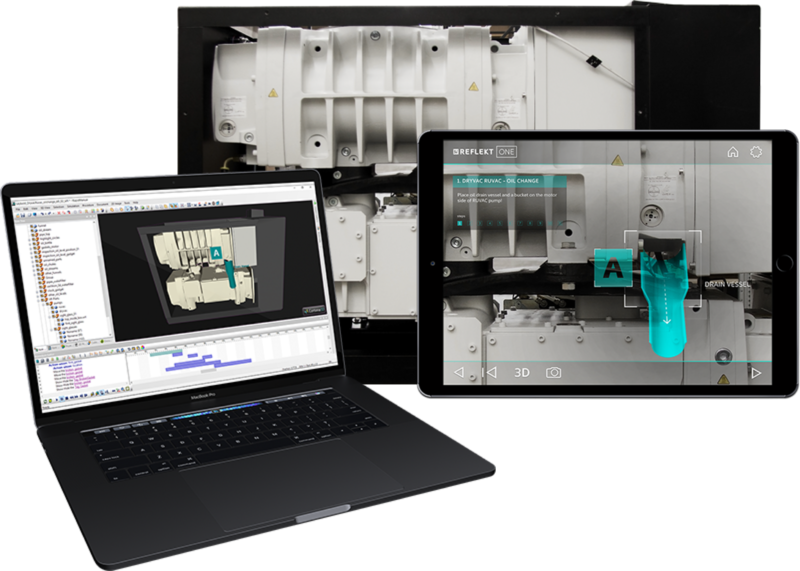 Work smarter with the REFLEKT ONE Plat­form to create indus­trial Augmented Reality appli­ca­tions without any special know­ledge of programming. Easily create Augmented and Mixed Reality indus­trial appli­ca­tions for use on major mobile and tablets opera­ting on iOS, Android and Windows systems. Activate Augmented and Mixed Reality content using dedi­cated markers or real life objects with our marker and edge based tracking tech­no­lo­gies. Locate and interact with click­able Points Of Inte­rest that effi­ci­ently display digital infor­ma­tion precisely on real objects in the right place, size, time and orien­ta­tion. Augmented anima­tions visua­lize 3D data directly onto a machine for Step-by-Step inst­ruc­tions to reduce errors and time spent on complex tasks. Re-use “any avail­able 3D content (CAD, VRML etc. )” to quickly and easily create Augmented and Mixed Reality appli­ca­tions to leverage tech­nical content. Inte­grate REFLEKT ONE into exis­ting CMS inter­faces such as Docufy Cosima/TopicPilot and StarAG GRIPS to expand the power of tech­nical docu­men­ta­tion. REFLEKT ONE encrypts all imported and published 3D data to ensure all sensi­tive 3D data is kept secure. Complete in-app main­ten­ance check­lists and check task status to improve quality manage­ment, and keep main­ten­ance processes up to date. Activate Augmented Reality content using dedi­cated markers or real life objects with our marker and edge based tracking tech­no­lo­gies. Access AR content from mobile devices anywhere – utilise exis­ting server based systems to access online or save all content directly into the app for offline envi­ron­ments. Publish AR content into a dedi­cated stan­da­lone appli­ca­tion or inte­grate AR scen­a­rios directly into exis­ting appli­ca­tions. Custo­mize the Graphical User Inter­face with Corpo­rate Iden­tity elements such as colours and logos to meet company bran­ding requi­re­ments. Use Augmented Reality to view live measu­rement values, signals or other dynamic data directly onto machines in Industry 4.0 envi­ron­ments using inter­faces such as REST API, XML or OPC(UA). View and interact with crisp 3D content precisely where it should be on the real object for Main­ten­ance, Opera­tions and Trai­ning scen­a­rios. Use VR Mode to view 3D infor­ma­tion without the physical object or in envi­ron­ments where the machine is not fully acces­sible from all angles. Rotate, zoom and move 3D objects to view compon­ents from any perspec­tive. Quickly and effi­ci­ently find and view compon­ents using the inbuilt filter func­tion and only see the rele­vant data when diagno­sing errors. Select an indi­vi­dual compo­nent in the AR or VR mode to view it in detail from all angles and zoom in to a perspec­tive that may not be acces­sible on the real object. Freeze the live camera image but keep all the inter­ac­tive content on screen. This allows users to put down the device and continue working (and viewing AR) with all features and func­tions still avail­able. 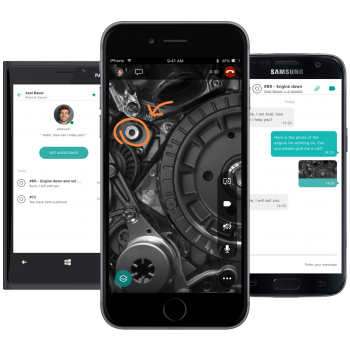 REFLEKT ONE supports inter­na­tional opera­tions with Multi Language Support –allo­wing users across the world to harness the power of AR in their native or chosen language. Scan a variety of nume­rical, text or picture based codes already on objects to get straight to important tech­nical docu­men­ta­tion, values or live data. Why not merge the real world with the best of Augmented and Virtual reality? REFLEKT ONE now supports publi­ca­tion to Mixed Reality glasses (such as the Micro­soft Holo­Lens). Utilize the latest smart glasses tech­no­logy to place inter­ac­tive digital objects into your envi­ron­ment. Enhance sales efforts by digi­ta­li­zing show­rooms, empower tech­ni­cians with hands free main­ten­ance infor­ma­tion anywhere or increase infor­ma­tion reten­tion with state-of-the-art trai­ning. Improve your effi­ci­ency in produc­tion, main­ten­ance, tech­nical docu­men­ta­tion, trai­ning or marke­ting: you don’t even need any programming know­ledge. We built REFLEKT ONE Augmented Reality soft­ware for your busi­ness. Enhance the func­tio­na­lity of ONE basic with our indi­vi­dual solu­tions ONE produc­tion, ONE service, ONE trai­ning or ONE marke­ting. REFLEKT Remote is the “One-button solu­tion” to directly connect tech­ni­cians to a dedi­cated support expert and provide real-time video support with Augmented Reality. RE’FLEKT’s “Intel­li­gent Routing” tech­no­logy imme­dia­tely iden­ti­fies and connects tech­ni­cians to their support expert on smart­phones, tablets or smart glasses. REFLEKT Remote enables the expert to guide the tech­ni­cian by drawing and placing augmented inst­ruc­tions directly into the technician’s field of view.